We have completed the 18″ Grape lamp shown in production in an earlier post. 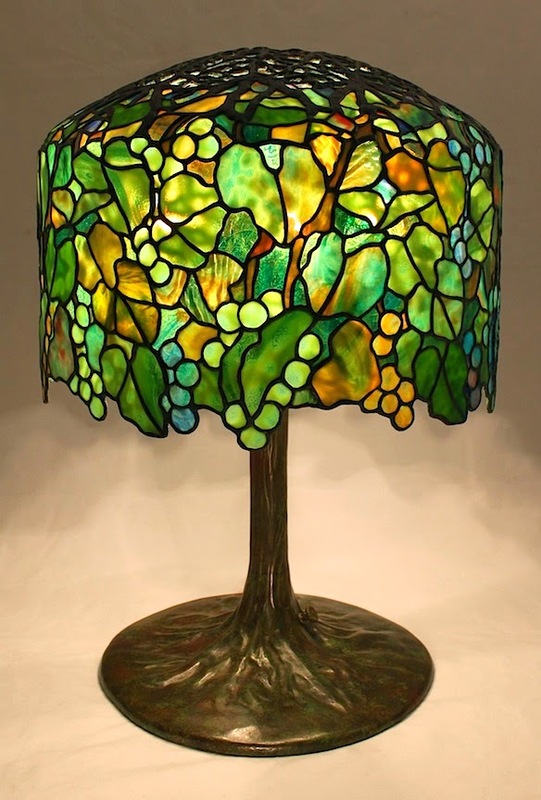 This shade is one of four 18″ tree-style shades by Tiffany Studios which were designed to mate with the large Tree Trunk base. These tree style shades have a large cast bronze crown of openwork branches at the top. The 18″ Tree style lamps with integrated shades and bases represent some of the earlier, more elaborate lamps designed by Tiffany Studios. 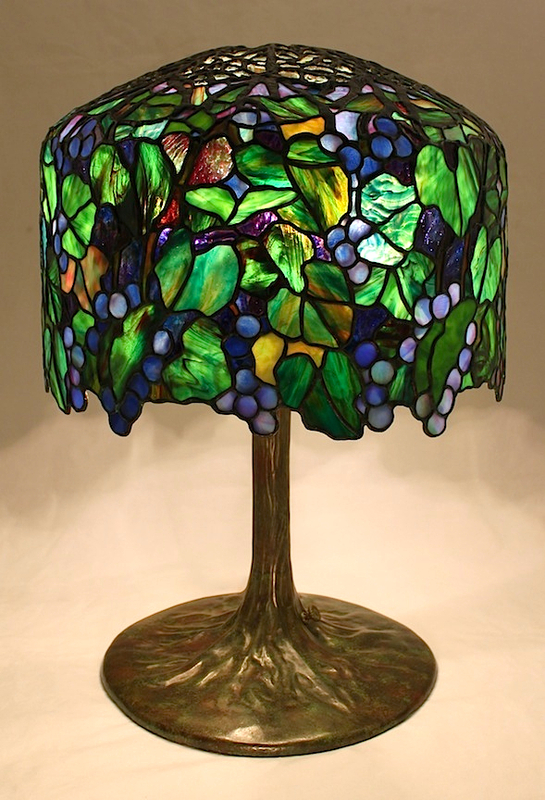 Only a few lamp patterns using the Grape motif were designed by Tiffany Studios, and most were cone shaped, intended for use as large chandelier fixtures. With its lush foliage and fully ripened grapes hanging realistically along the lower edge of the shade, the Grape is one of Tiffany’s most successful shade designs. Inspired by the ability to create a dramatic showpiece using some of our finest glasses, we decided to create this piece as a two sided lamp. 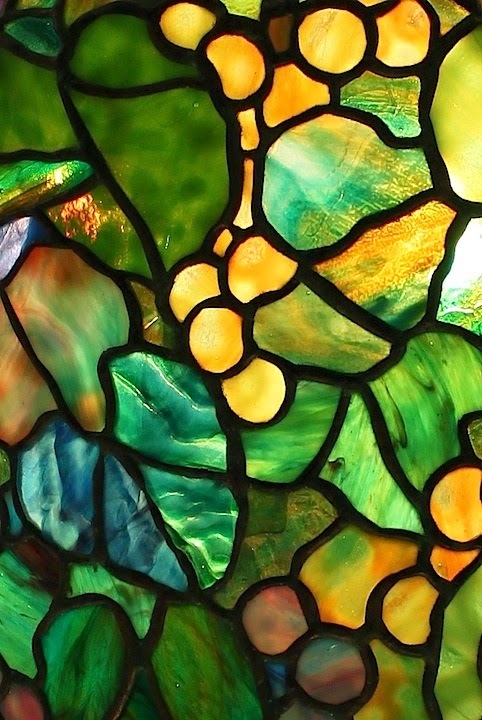 This unusual technique of blending the colors to shift from one side of the shade to the other takes a lot of planning and careful glass selection. The Grape shifts color from lush jewel tones of purple and blue on one side to brighter, vibrant greens and ambers on the opposite side. Many of the glasses used to create this shade were made over 20 years ago by makers such as Schlitz and Lins. Carefully selecting from our extensive glass library, the colors shift when the shade is spun in either direction. The deep velvet tones of night gradually lighten to reveal our grapes in full sun, illumated by an Autumnal light and ready for harvest. As can be seen in the photo below, both sides blend seamlessly into each other. The most challenging areas of glass selection were the blended portions which had to use elements of both color schemes without creating an abrupt line of color where the tones shift.